Last night's episode of Man v. Food Nation on Travel Channel showcased Charlotte eateries that you've either made a beeline to often or at least have heard people rave over. Host Adam Richman and crew visited Charlotte a few months ago to try out popular or extreme menu items at The Penguin Drive-In (Plaza Midwood), Price's Chicken Coop (South End), and Jackalope Jacks (Elizabeth). 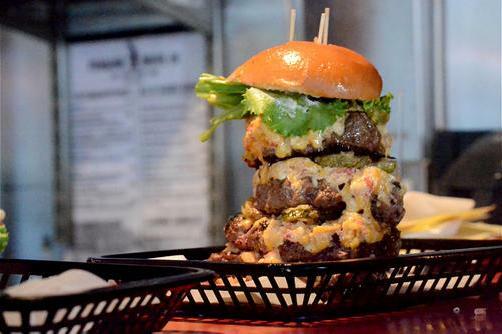 The Penguin's Double Pounder (pictured below), with four half-pound patties (two pounds of beef), pimento cheese, and fried pickles, is the star of the show (and a cardiac event waiting to happen). I can personally attest to the mouthwatering goodness served at The Penguin and Price's, but I've never eaten at Jackalope. If you missed the show last night, it re-airs this Saturday at 12 p.m. You can also watch a few video clips from the episode by clicking here.